Nothing brings up childhood memories better than smells or tastes. That's what makes family recipes so great; as soon as you smell the aroma of a favorite recipe wafting from the kitchen, you're back in second grade, sitting on a stool eating green beans with your grandmother's (semi) famous chili sauce drizzled over the top. I didn't grasp the significance of it at the time, but those jars of chili sauce — arriving toward the end of summer in brown boxes stamped with Tennessee return addresses — were the result of hours of cooking, days of harvesting, and months of growing in my Uncle Earl's back yard. It's one of those rituals I can only appreciate now that I know first-hand the struggle of coaxing vegetables from the smallish pots we have scattered around the front and back of our yard-less townhome. This year I started pickling a few small batches of the season's best goods — strawberry preserves, spicy okra, jalapeño salsa and the like. The preserves were by far the biggest endeavor, preserving the incredible perfect sweetness of Florida strawberries at their short peak. But it's the vegetables this time of year that have me lugging out the canning gear and sterilizing my glass jars. A surplus of green bell peppers from the co-op were the final straw in getting me to try my grandmother's chili sauce recipe. This sauce is sweet and comforting, and doesn't have to have any actual chilies in it at all. We brought the first jar to our house church and sent the jar home with Patti, who liked it so much she wanted to keep the whole thing. This sauce has that effect on people, especially kids. I don't remember eating green beans without a spoonful of Gigi's chili sauce on top when I was a kid. If you get up the nerve to take on this kind of project, let me know how it goes for you! I'm thrilled to be able to share this family recipe with you. 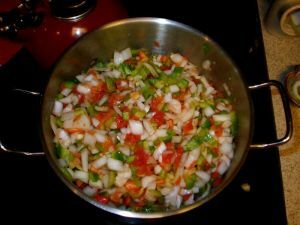 This chili sauce is excellent on green veggies, pork, and pretty much anything else that needs a sweet kick in the pants. Be sure to inspect the jars and lids very carefully, discarding any with dents, cracks, or other blemishes before you begin. Dixie says that the following ingredient measures are "give or take a little." You really don't have to be too precise. 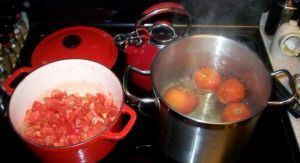 Scald and peel the tomatoes and cut them into chunks. Put them in a large pot and cook them about 15 minutes; then scoop off about one quart juice. 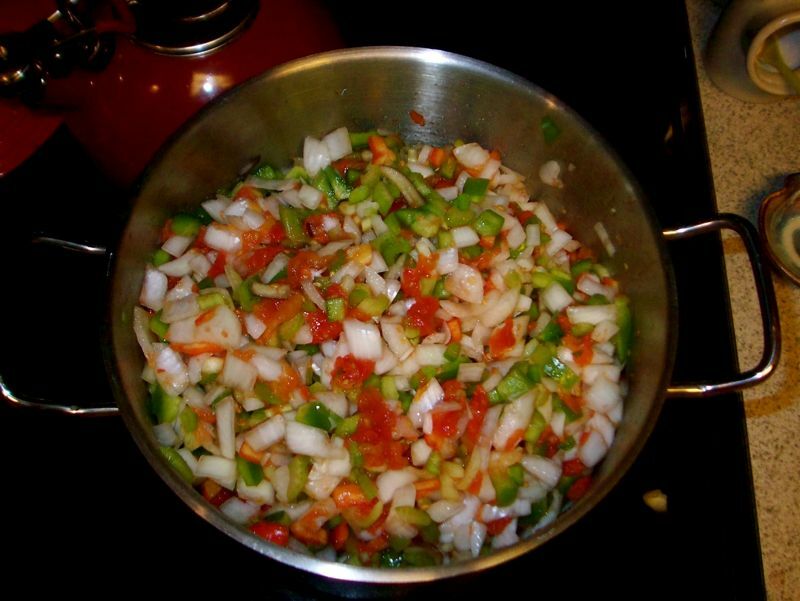 Add the chopped celery, onions, and peppers to the tomatoes and simmer about 1 ½ hours. Put your whole spices in a metal tea ball, or tie them up in a piece of cheesecloth or a clean old t-shirt using a clean piece of string. (You will want to remove them when the chili sauce is completely cooked.) Drop the spice package into the pot with the vegetable mixture; then add the powdered spices, brown sugar and vinegar. Cook 1 ½ hours longer, or until vegetables are soft, stirring very often — almost constantly. Remove the spice bundle. 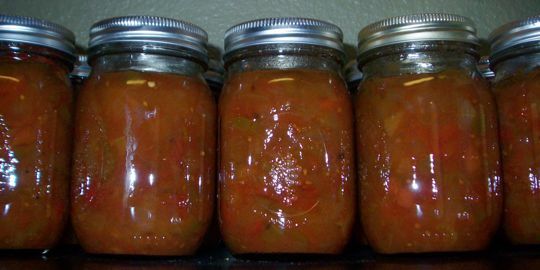 About ½ hour before the chili sauce will be fully cooked, load canning jars into your dishwasher and run it. That way they will be clean and hot when you are ready to fill them. Preheat your oven to 350° F. When you are ready to can the chili sauce, pour it into hot jars, wiping the lip and screwing on the sealer lid of each jar as you go. When all jars are filled, set jars on a sturdy cookie sheet or baking pan and put them in hot oven. TURN OVEN OFF IMMEDIATELY. (If you have a partially full jar left, let it cool and then put it in the refrigerator to use first.) Leave jars in oven until they are completely cool. Check to be sure that all jars have sealed — that is, that the "dome" of the canned lid is down. NOTE: If you like your chili sauce hot, you can put a hot pepper in the bottom of each jar when you fill it. The hot chili sauce will "cook" the pepper and flavor the whole jar of sauce — just be sure you mark which ones are hot!